The mocking of romantic comedies is nothing new; it's been done time and time again. Let's be honest, it's pretty easy to poke fun at Tom Hanks and Meg Ryan's many meet-cutes that defined the expectations people have of love in the modern era. But what's charming about the feel-good rom-com Isn't It Romantic is how the genre is satirized in a way that is fun and respectful to those who still want a good old-fashioned love story. 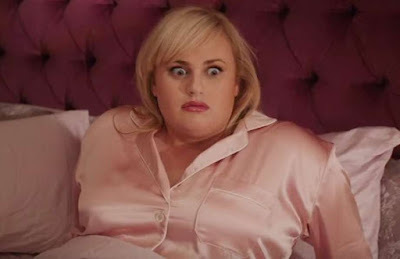 Plus it's got Rebel Wilson, and that's always a plus. Unlike the spiteful (and awful) anti-rom-com They Came Together from a few years ago, Isn't It Romantic doesn't have a mean bone in its body. And perhaps that is because of co-screenwriters Katie Silberman and Dana Fox, who have comically parodied the genre previously with Set It Up and How To Be Single. Together they've penned a film that should be rewarding than just another bouquet of flowers this Valentine's Day. Pretty Woman is the model most fantastical rom-coms aspire to, and as a child Natalie (Wilson) was obsessed with it. That's until her mother (Jennifer Saunders, rode hard and put up wet) tells her not to believe in such fairy tales because they aren't meant for women like them. As an adult Natalie took that message to heart. She no longer believes in those clichés and turns up her nose at the very notion of falling in love. When her office mate Whitney (GLOW's Betty Gilpin) tries to watch a rom-com it sets off a fusillade of negativity from Natalie. It turns out to be justified. At Whitney's suggestion to open herself up to the possibility of romance, Natalie's flirty eye contact with a guy on the subway leads to a different kind of contact; an attempted mugging and a successful head injury. In the most recent episode of my podcast I bemoaned the number of movies in which women have suffered traumatic head injuries only to wake up in an altered state of reality. I don't know what the Hell kinda phenomenon this is, but we can add Isn't It Romantic to the growing list. Natalie's world is now like something out of a romantic-comedy with all of the generic, insulting tropes that come along with it. The grimy, crowded New York streets are now sun-kissed and full of color; Whitney has transformed from her mousey friend into a vindictive office witch; her shady neighbor Donny (Brandon Scott Jones) is now her stereotypically gay friend; and she's suddenly caught the eye of hunky a hunky real estate investor (Liam Hemsworth) who wouldn't give her the time of day before. The only one who didn't undergo some drastic change? Natalie's best friend and obvious soulmate, Josh (Adam Devine), who still sees all the good things in her just as he did before. The only problem, is that he has fallen prey to a different rom-com trope when he gets engaged to a gorgeous supermodel and yoga ambassador (Priyanka Chopra) who is clearly wrong for him. Isn't It Romantic both embraces and scrutinizes the genre, with some of the best bits as Natalie tries to navigate a very PG-13 world. Foul language and sexual activity are merely teased but never fulfilled, much to Natalie's torment, adding to her desire to get the Hell out of this nightmare she's trapped in. Who wants to live in a world where spontaneous musical numbers are a thing??? But of course, there's also a lesson to be learned about reliance on oneself and being independent when so many of those old rom-coms have women who need men to fulfill them. It's a pretty basic theme to get across but it works, and Wilson is the perfect star to deliver on it. More believable in this role than Amy Schumer was in I Feel Pretty, Wilson commits to making every rom-com trope endearing, no matter how silly they are. She also has terrific chemistry with Devine, no doubt established through their romantic squabbles in a pair of Pitch Perfect movies. Whether you love or hate romantic comedies Isn't It Romantic has something to offer. It doesn't exactly take a scalpel to the genre, thank goodness, and no matter what the story still follows along familiar beats, but you won't have to wake up from a coma to enjoy it.